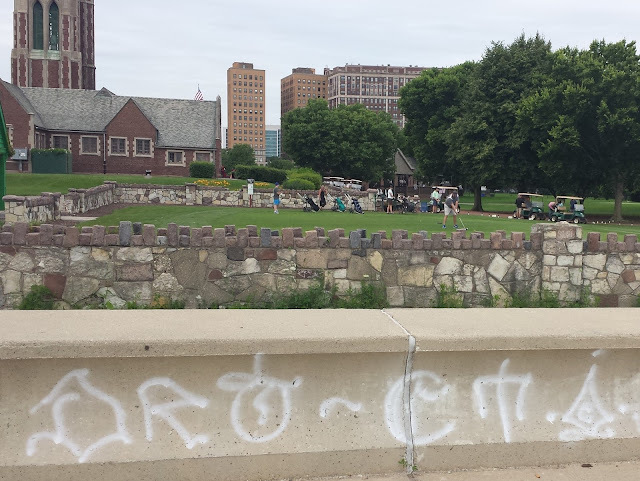 Golfers teeing off at Marovitz Golf Course are unaware of the gang tag war that lies steps away. A man and a teenage boy were stabbed Friday night near the Sydney Marovitz Golf Course at 3600 N. Recreation Drive. Both victims walked into Illinois Masonic Medical Center to seek treatment at 11:15PM. The 16-year-old was stabbed in the back and his 23-year-old companion was stabbed in the right abdomen and right hand. Both of their conditions have been stabilized. The victims, who are Hispanic, described the offenders only as Hispanic men. As CWB Chicago has reported frequently, the lakefront area around the Rec Drive tennis courts, baseball fields, and seawall is a popular late night hang out for gang members. Gang tags at the nearby seawall detail an active rivalry between Hispanic gangs. CWB reported more than a dozen gang tags at the lakefront to the city on July 20th. Streets and Sanitation closed out all of our requests for removal the next day as "complete." None of the tags has been removed. More on that later.